Compton California parents demonstrated against the fraudulent use of their signatures on petitions to bring a charter school into their school (McKinley Elementary School in Compton) on Friday, December 11, 2010, outside a meeting in Compton. A group called "Parent Revolution", financed by billionaires, claimed that parents had signed petitions to demand the charterization under a controversial California "trigger" law that promotes the privatization of inner city public schools. Los Ageles Times photo.In what will likely go down in corporate ed reform history as the Compton Caper, the otherwise disgusting LATimes is reporting that Compton parents are coming forward with allegations of strong-arming and deception by Parent Revolution to get enough signatures to charterize a public school that has recently demonstrated strong improvement on state test scores. Sensing an all-out repudiation by the school community of the oligarch-funded front group, Parent Revolution, Austin and Barr called up the Governator and L.A.'s plutocratic mayor to try to get ahead of the story. The spin from the oligarchs? The parents who have been lied to and manipulated are the real culprits, as they represent anti-charter forces who are trying to undercut the will of the oligarchs people. This clearly shows the depth of the corruption, and it clearly goes all the way down to the Governor's Office. 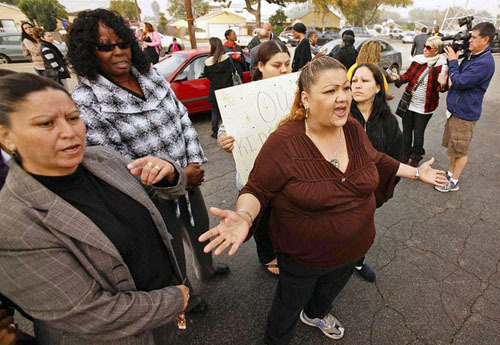 Tempers flared Friday (December 10, 2010) over the fate of a low-performing Compton elementary school that has become the first target of a new law allowing parents to mandate school shutdowns or charter-school conversions through a petition drive. Some parents are rescinding their signatures to convert McKinley Elementary into a charter school that would operate outside the direct control of the Compton Unified School District. Under the state's new "parent-trigger" law, which is being scrutinized > nationwide, the signatures of at least half the parents at a campus > are required in order to launch the changes. But that 50% threshold could be at risk at McKinley. Opponents say that 50 to 60 parents already have withdrawn their support, which > could push the total close to the minimum level required. "They told me the petition was to beautify the school," said Karla Garcia, whose two children attend McKinley. "They are misinforming > the parents, so I revoked my signature." Garcia is part of a growing countermovement that began with the delivery on Tuesday of the parent-trigger petition at Compton Unified headquarters. 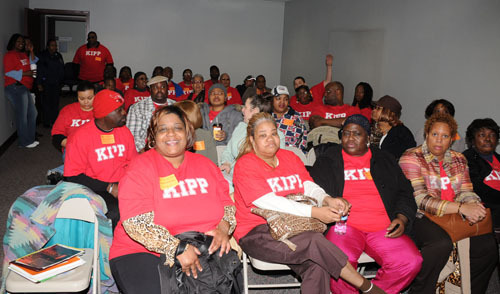 On March 25, 2008, while Arne Duncan was still Chief Executive Officer of Chicago's public schools, the KIPP charter school brought dozens of "parents" to a meeting of the Chicago Board of Education, wearing tee shirts that proclaimed "KIPP" and saying they supported putting the KIPP charter school into the Penn Elementary School on Chicago's West Side. When asked the names of their children who were attending the KIPP school they supposedly supported, most of the people in the photo above (from the "holding room" CPS uses on the day of the Board meetings) refused to talk to Substance. Substance was told that KIPP filled the buses with local residents, many of whom didn't have any idea of what the activity was for. Like many charter schools, the Chicago KIPP schools use controversial tactics to attempt to show "community" support for their work. The Penn Elementary School community has been adamantly opposed to the KIPP "takeover" of the Penn building since it was ordered by Arne Duncan two years ago. Substance photo by George N. Schmidt.Parent Revolution, a Los Angeles-based nonprofit group that organized the petition drive, denied any wrongdoing. Organizers said they had collected signatures representing 62% of McKinley's 438 students. Initially, media coverage focused almost exclusively on dissatisfied parents relating grievances against McKinley, where test scores rank in the state's lowest 10% of schools, even when compared with schools that serve students from similar backgrounds. The school's Parent Teacher Assn. held two meetings Thursday in which parents said they had been harassed or deceived into signing. On Friday, Gov. Arnold Schwarzenegger, a supporter of the parent - trigger effort, took the other side, condemning alleged > "intimidation tactics" by charter opponents at McKinley. Los Angeles Mayor Antonio Villaraigosa weighed in with similar views. The mayor was flanked by parents and petition organizers Friday as he visited the home of a Compton petition signer to praise the effort and condemn what he described as harassment by opponents. "It's particularly alarming to see these parents resort to the kind of intimidation, the kind of smear campaigning, the kind of rumor- mongering that is all too reminiscent of the way bad employers try to intimidate working people," Villaraigosa said. Parent Revolution, which is led by state Board of Education member Ben Austin, had arranged for Villaraigosa's appearance. But the visit sparked angry reactions from about two dozen parents and Compton leaders. Some demonstrators chanted "No charter school!" and carried signs reading, "Our Kids Are Not for Sale" outside the home where the mayor spoke. Parent Revolution had targeted Compton and McKinley for its first organizing effort. The group also decided that the petition would stipulate a charter conversion and it selected the charter operator, Celerity Educational Group. I am highly offended by an outsider coming in telling people here how to handle my children or handle my school," said Lee Finnie, a pastor and parent of three McKinley students. Finnie and other petition opponents cited McKinley's recent progress, noting its rising test scores and new principal. The school's 77-point two-year rise on the state Academic Performance Index puts it among the most rapidly improving schools in the state. "Why blow up something that's improving?" Finnie said. "Rome wasn't built in a day." The school has made "excellent progress," said Olivia Fuentes, a specialist in the division for school improvement with the Los Angeles County Office of Education. . . . The school's defenders said the petition organizers had failed to acknowledge the school's gains. Jessy Herrera, an active member of McKinley's PTA and school site council, complained that organizers had followed parents to worksites, laundromats and restaurants, and repeatedly visited and called homes, even after parents declined to sign on. Other parents said they were told if they didn't sign, the school would close or they would be deported. By the way, what Legislature would vote to allow the democratic process to be hijacked by the parents of any public school? The public school is supported by all taxpayers in the community, not just the ones with kids enrolled. What about parents with children about to start school? Or taxpayers without children, for that matter. Obviously, the customer service model of democracy has taken over entirely in California.